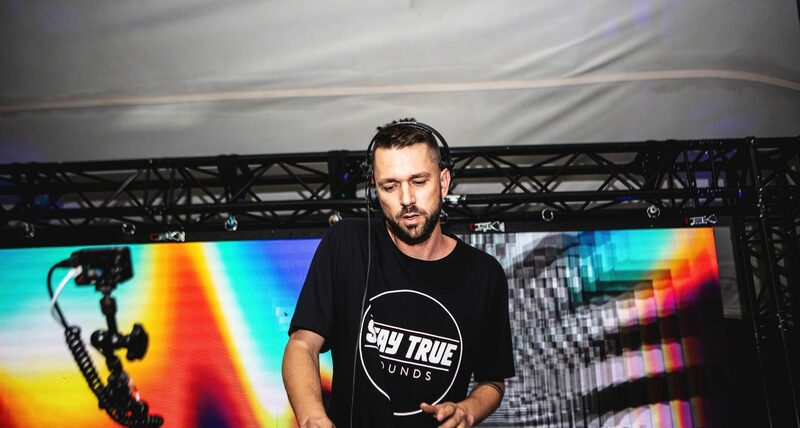 True Music Series took Cape Town by storm. The stage saw the likes of Charles Webstar, Kid Fonque, Sio, Irshaad Samaai and many more deejays on the decks. House favorites such a Charles Webstar and Kid Fonque both delivered stunning sets – no surprises there as they are both seasoned house music stars. The True Music Series fuses music and art to create a unison union between the two mediums. This was achieved by partnering with vibrate street artist Felipe Pantone from Argentina. The streets artists face is not usually seen in photographs, so it remains a mystery to most but his work is highly recognizable from its sound wave patterns. Felipe’s work fuses bold graphics, strong contrasts and vivid colours with mixed typography to create ultra-modern art that often brings music to life. His artwork will connect to sound reactive projectors in each space, creating its own equalizer and allowing both musicians and fans to experience a visual representation of the music produced. The True Music Series is set to visit six African cities by giving them an unforgettable experience. Check out the previous True Music Series event we attended HERE.